Herrin opened June 2008 at 2824 Real St. Austin, TX. 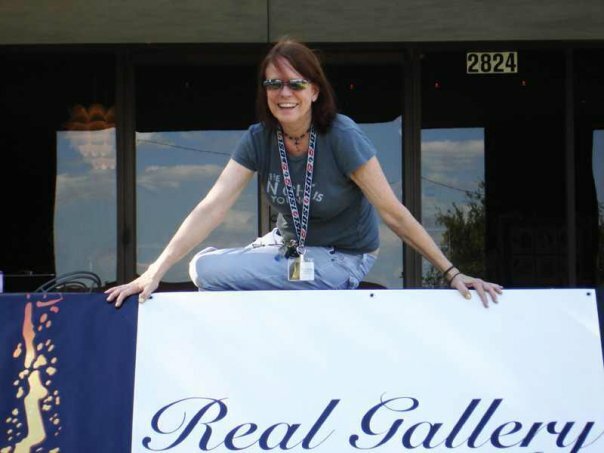 Owner, Kathi Herrin, operated her fine art venue at this location in East Austin June thru Nov 2008. The mission of Real Gallery was to promote local artists in beautiful venues where they could exhibit their work in solo/group shows. That mission paid off for many of the artists that graced the doors of Real Gallery. Herrin leased a second location in East Austin Sept 2011-March 2012 at 1101 Navasota #3 Austin, TX 78702 and stepped up to juried fine art exhibitions. Herrin is extremely grateful to all the artists and guests that have participated in the success of Real Gallery. Herrin also coordinated shows at other venues and operated pop up fine art shows in variuos spaces throughout Austin during 2008-2012. Some of the venues included Fair Bean Coffee, Scarbrough Building, Scooter's Coffee North and South Austin. Herrin rented large retail spaces on Congress Avenue Downtown Austin and in the Second Street Shopping District for some of her pop up shows. Real Gallery is Herrin's business name and website where she promotes her current work, Clay Works by Kathi Herrin. Herrin exhibits and sells her work in galleries and art shows throughout Austin and surrounding cities.